Storm Damage Archives - Beneficial Roofing | VOTED BEST Roofing Company, Call Us Today & See Why! If you own a home, it is important to make sure that you are always prepared for disasters that might strike. One of such disaster that might occur now and then includes storm. Storm can cause damage not only to your roof but to your entire house too. This is why it is important to be prepared at all times to ensure that when it occurs such damages do not happen. Your roof is very crucial because it is the one that protects your house from such occurrences. Therefore, it is important to ensure that your roof is strong and in good condition to be able to withstand all the effects brought about by storm. To assist you in this process, here are some of the roofing storm preparedness tips you need to apply. One of the greatest tips you need to apply to ensure that your roof is safe from a storm is to check if it has any weaknesses. You should carry out a visual inspection in order to note if there are any loose or missing shingles. It is also important that you check for cracks or gaps between the roof and the rest part of the house. This will ensure that such gaps are filled to avoid leakage that might arise as a result of the storm. Make sure that you recognize any issues with your roof that might get worse with the storm so that they are handled well in advance. Call Beneficial Roofing for FREE Roof Inspections. You should also check if there is any tree near your property that might fall on your roof if the storm escalates. In case there is any, you should call an arborist to come and cut it down or remove branches that might fall on the roof. If your roof has aged or was installed many years back, it is advisable that you do a thorough renovation. This is necessary because an old roof has high chances of being destroyed completely by the storm compared to a new one. It might cost you some money to do the renovation, but it is worth the cost because you might even spend more in case it gets damaged by the storm. Or if you wait for storm damage- insurance may be liable for repairing/replacing the roof. When there is storm there are always risks of water damage from occurring. The water damage can even affect your roof or any other part of the house. This is why you need to have phone contacts of the nearest water damage professional service so that you can call them in the case of any emergency. If you follow all our tips you shouldn’t be worried about the incoming storm. The thing you should do now is always be prepared for the worst and know a professional and trusted roofer in your area. In case the worst happens and your roof suffered damages from the storm. Make sure to call us so we can start offering you security and peace of mind when it comes to your roof. A hail may occur during any strong storm; That is, hail represents a threat everywhere. When hail falls, roof coatings can be destroyed and water can damage ceilings, walls, floors, appliances, and your personal possessions. Knowing what ceiling coatings offer good impact resistance can save you money and trouble. Most roofing jobs can not be done by yourself. Unless you have experience replacing roof coatings, hire a professional roofing contractor. Before re-roofing, check with local building officials about what local building codes are. If you are replacing the old, worn roof tile with asphalt shingles, make sure they have a Class 4 rating under Underwriters Laboratories (UL) Standard 2218. A Class 4 rating ensures that a sample of the product did not crack after being hit twice in the same area by a two-inch steel ball. The UL 2218 standard is a practical method for performing impact resistance testing, although it is not perfect and works best for some roof liners than for others. The UL standard measures whether a product cracks after receiving an impact. Some roof coverings, especially some made of metal, may not crack but have dents and holes. Therefore, even if they pass the test well, they may not be practical. Keep this in mind when using a UL standard to measure the quality of a ceiling coating. If you are indoors when there is a storm with large chunks of hail, stay there. Because large hail can shatter windowpanes, close your drapes, blinds, or curtains to prevent wind from throwing broken glass into the house. Stay away from skylights and doors. If it is outside, immediately get under a shed. 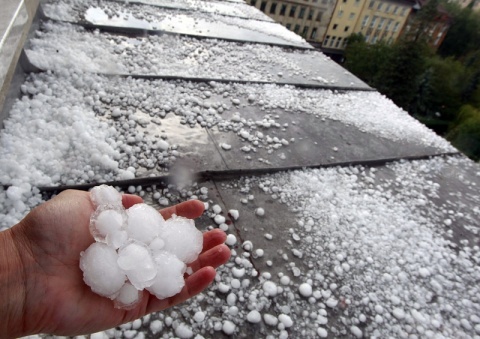 For more information on protecting your home from hail damage, visit the Business and Home Safety Institute or contact your local Beneficial Roofing Office.